So after March and April 2018 being, relatively speaking, the worst two months I've had on my solar since install back in 2012 compared to 6 years of previous Marches and Aprils, it looks like May 2018 will end up being my best month overall vs any other month in any other year - today (29th) I'm equal in generation to my best ever month which was July 2014, and some 30kWh better than any previous May. Very, very odd year. Same here. At the moment I am at 286 and 2kWh behind my best previous May in 2011, so I shall beat that this afternoon. My best month ever was July 2013 at 300, with July 2014 at 274, so perhaps some regional and orientational variation. Very strange year, also what about February? My previous best ever percentage month had been 131% July 2013, but Feb 18 was 142%. Already beaten best previous May, and looks like being my first ever 700+ May, and only my fifth ever 700+ since 2011. And not to forget the ridiculous monsoon-style cloudburst thunderstorms we had over London this weekend - I have never seen rain like it in the UK. I had water coming in through my Velux window it was completely innundated. Maybe the extra rain this year has eventually cleaned the panels? I have 2 days to meet our average for May, we are having the lowest May for far, and are 1.5 kWh below our previous lowest, but have two days so i am confident that we will at least meet the average, and one half decent day should put us in our best may month. I should note were currently at 476 kWh our average is 480 kWh and our best is 485 kWh so we are in the right ball park for May. Very strange month, i thought we would easily generate a new record. Compared to PVWatts we see odd results. System is a bit oddball, 1kw, 20 degree tilt, SW facing with very short cable runs, veranda mounted open frame so a hard switch on as the sun comes around the house. May is on course to better last year by a tiny bit. System install date was late April, so logged may 1st onwards. I've had my system since Nov 2011 and sadly (but probably I'm not alone) I manually keep daily records in a spreadsheet. On Friday total annual output year to date exactly matched, to two decimal points, the best ever year to date, which was 2015. 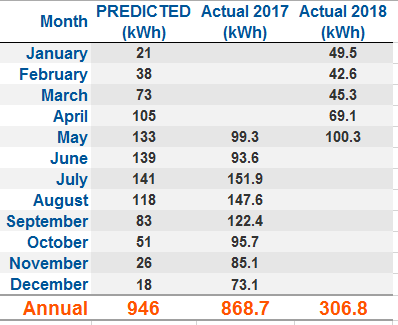 I'm always amazed by the consistency of our annual readings, ours went live in Nov 2011 as well and we've only deviated a few hundred kwh above or below our PVIGS predicted annual generation figure in any one year. Our RE returns have been the best ever and I only light the stove once a month to make sure everything is in order. We had serious drought at a time when our fruit trees needed water and even though i had water and did water them, The sun was too hot and they started ripening too early. Now we have Bramleys that look like eating apples and eating apples like Gala that have a very odd texture and color. Thankfully our plums are doing well and we have one small apple tree with excellent looking edible fruit. These past few weeks have been normal, with plenty of rain and good steady wind. Our W/T is performing well and we could not ask for more. Then Fredarica turned up when Diesel left for the happy hunting grounds. In my dabblings through the innards of a small engine carburetor, I leave Angel and Fredarica to their own devices but cannot help but feel slightly miffed and annoyed as Fredarica spends her time taking the Michael out of Angel. Walking slowly across the shed floor and under the forklift,,and Angel has to lie down and shove her nose under it to see where the bird went. Meanwhile Fredarica has exited the far side and flown up and over the forklift to sit and look down on Angel efforts. I never knew that a robin would behave like this. She knows she is safe with Angel but goodness knows,,we do have the odd feral cat passing through and if she walked across the floor like that in front of one of them,, . She is as bold as brass and will bounce herself off my knee when she wants attention, I take care not to have her feeding out of my hand. I don,t want that. I think that is not a good idea. However providing food for her is ok to a point. She has her young but will not let them feed at the table. The Gala never looked like that before. At least the plums are holding up well.